Okay, Lepidoptera lovers. You win. It’s official. I’m hooked on butterflies. Great, just what I need, another field guide to buy. Late this afternoon I (finally) went out for a walk by myself, camera in hand. There have been a ton of butterflies around lately, very few of which I can identify by sight, but my interest in them has been growing ever since I photographed a few butterfly corpses back in April. 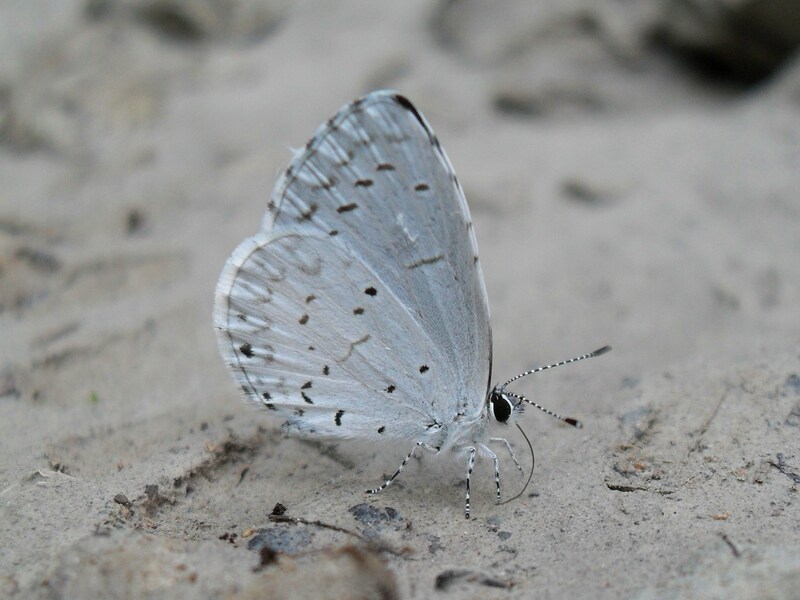 A tiny blue one landed on the gravel road in front of me, and I dropped to my knees and started trying to creep close enough to it to get a decent photo. Now, I’d been seeing these little blue butterflies everywhere lately without knowing what they were, and I’d also been reading about hairstreaks on other blogs, but I simply had not made a connection between the two until I got close enough to this critter to see the black-and-white zebra stripes on its antennae and legs. A switch was flipped in my brain. Oh my goodness! I know this one! It’s some kind of hairstreak! Tell me that isn’t the most gorgeous thing you’ve ever seen. My first decent photo of a live butterfly! I can’t deny it any longer. I’m hooked. I haven’t yet been able to figure out what specific hairstreak species this is, but I’ve posted the photo to BugGuide, and if someone else comes up with an ID for it I’ll add it here. There were also Red Admirals and Question Marks fluttering about, but they wouldn’t pose nicely the way the hairstreak did. I have to love any animal named after punctuation – a pair of Question Marks swirled around me for quite a while, sometimes so close they brushed against my head, occasionally landing in a patch of light on the shade-dappled path and turning to orient their wings toward the late-afternoon sun. Butterflies weren’t the only interesting insects I found on my walk, either – here’s a bonus photo of a large unidentified black stink bug, whose orange-tipped antennae caught my eye. 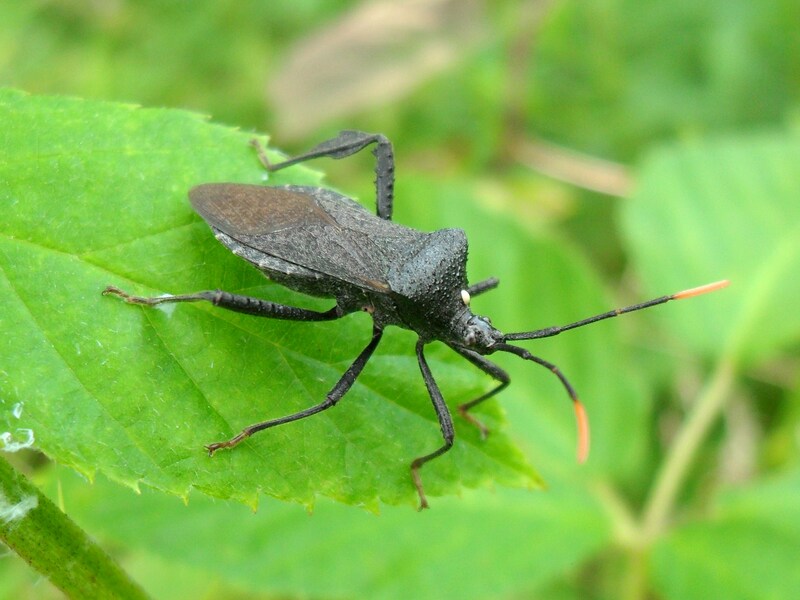 UPDATE: The helpful folks at BugGuide identified my so-called stink bug as a species of leaf-footed bug, Acanthocephala terminalis. (Hey, at least I had the order right!) The gentleman who ID’d it also pointed out the white dot on its head as the egg of a tachinid fly, meaning this guy is eventually going to be eaten alive, from the inside out, by a fly larva. Nature is so cool! UPDATE THE SECOND: See the comments below for the identification of the butterfly… which is actually not a hairstreak at all. Well, at least I’m learning! Hi, Rebecca. The butterfly you show is the Spring Azure, Celastrina ladon. This is one of those species that has a wide variation in forms and currently has several varieties lumped into this one species. In years to come, this could be another of those armchair ticks as varieties are assigned species status. The form most common this time of year is often referred to as the Summer Azure.